Nail tech Sarah Waite created this design using China Glaze’s My Little Pony collection. “The wide sections of glitter combined with the fun, youthful polka dots create a look that is familiar yet new at the same time — just like My Little Pony,” she says. 1. After applying one coat of Strong Adhesion Base Coat, paint one coat of Sweet As Pinkie Pie. 2. Using a tape technique or freehand, add a block of I Just Canterlot diagonally at the tip of the nail. 3. 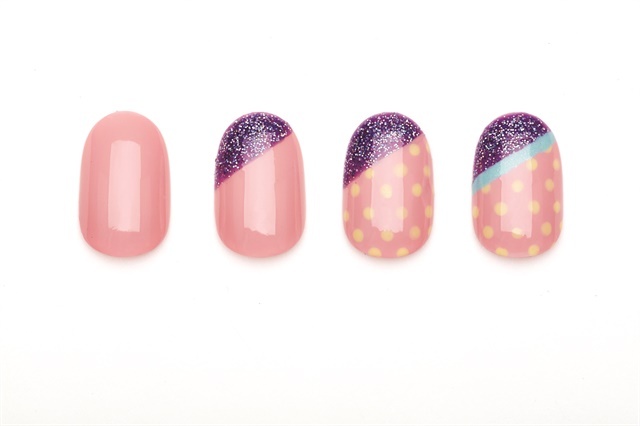 Use a dotting tool and add polka dots of Kill ‘Em with Kindness over the entire nail. 4. Use a striping brush to add a wide stripe in One Polished Pony to separate the pink and purple. Finish with China Glaze Gotta Go Top Coat to protect your design.